When you eat food, your body digests it, sending chemicals from the food to your cells. When your cells receive simple sugars like glucose, they are burned for energy. However, that energy is mostly produced in one part of the cell: a small organelle called the mitochondrion. The cell needs energy in many different locations, however, so the energy that comes from burning simple sugars is “packaged” into smaller units that can be distributed throughout the cell. The units are stored in molecules called ATP. When the cell needs energy, it breaks down the ATP, releasing the energy that has been stored there. So a cell takes the energy that comes from burning simple sugars and stores it in small units that are held in a molecule called ATP. The ATP is then shipped to where the cell needs it, and when that part of the cell requires energy, ATP is broken down so that the energy is released. The two molecules into which it is broken down (ADP and P) eventually make their way back to the mitochondrion, so that they can be put back together to store another unit of energy. The process by which all this is done is mind-bogglingly complex. Ask any biochemistry student who is required to memorize all the chemical reactions that take place in order for this to happen in a cell! Now we know that this process is not only mind-bogglingly complex, but part of it is nearly 100% efficient! Researchers from Japan studied the step in which ATP is actually formed. Essentially, the process by which the simple sugars are burned produces a high concentration of hydrogen ions (H+) on one side of a membrane. The hydrogen ions want to move from that area of high concentration to an area of lower concentration, but the only way to do that is to move through a molecule called ATP synthase, which is illustrated above. The molecule has two basic components: a rotor system that turns as the ions pass through it (called the Fo portion), and a synthesis unit that forces ADP and P to combine to form ATP (called the F1 portion). As the hydrogen ions flow through the rotor portion (shown in purple in the drawing above), their motion causes the rotor to turn. When three ions pass through, the rotor has made one-third of a complete turn, which is enough energy for the synthesis unit (shown in green in the drawing above) to force ADP and P to join together, making one ATP.1 You can watch this short Youtube video to see an animation of how the system works. One question that you can ask is, “How efficient is this method for making ATP?” After all, the protons moving through the ATP synthase have a certain amount of energy. When the ATP synthase makes ATP, the result is a certain amount of energy stored in ATP. How much energy is wasted in that process? For every 1 Joule of energy in the hydrogen ion motion, for example, how much energy ends up in the ATP? If 0.9 Joules ends up in the ATP, the system is 90% efficient. If only 0.5 Joules ends up in the ATP, the system is only 50% efficient. We found that the maximum work performed by F1-ATPase per 120° step is nearly equal to the thermodynamical maximum work that can be extracted from a single ATP hydrolysis under a broad range of conditions. Our results suggested a 100% free-energy transduction efficiency and a tight mechanochemical coupling of F1-ATPase. Remember, an ATP is formed for every one-third turn, which is a 120° step. So the researchers found that under lots of different conditions, this part of the process is essentially 100% efficient:3 it converts into ATP all of the energy that the laws of physics allow it to convert! How surprising is that? Well, let’s consider what Gizmag calls the most efficient engine in the world today. It is just over 50% efficient. 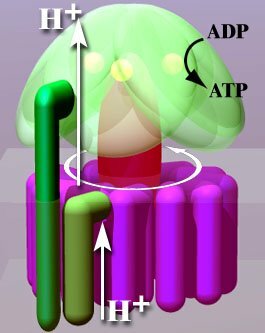 I don’t know of any marvel of human technology that comes close to the efficiency of the F1 portion of ATP synthase. Of course ATP synthase was designed by the Almighty Engineer, so it really isn’t reasonable to expect that people could come up with anything so efficient! 1. Neil A. Campbell and Jane B. Reece, Biology, Sixth Edition, Benjamin Cummings, 2002, p. 167. 2. Shoichi Toyabea, et. al., “Thermodynamic efficiency and mechanochemical coupling of F1-ATPase,” Proceedings of the National Academy of Sciences of the United States of America, 10.1073/pnas.1106787108, 2011. 3. Please note that this does not mean the process is actually 100% efficient. That is physically impossible. Any time energy is converted, some portion of it must be used to disorder the universe. As a result, the laws of physics tell us that no machine can be truly 100% efficient. What the researchers mean is that the process essentially converts 100% of the energy that the laws of physics allow it to convert. Yup, memorizing the entire glyoclytic pathway, and the entire oxidative phosphorylation pathway, was a lot of memorization! But worth it. This is very cool though about the 100% efficiency. And people ask how I can study science and still believe in God (or a Creator depending on who asks). How can you study science and not? I completely agree, Vivielle. I just can’t understand how anyone can seriously study science and not understand that what he or she is studying was made by God. Dr. Wile, I would say that it depends on what science you’re talking about. As a former geologist, I know that design is essentially a non-existent concept in the study of earth materials and processes. Perhaps that’s why there are so many more creationists in the life sciences than in the earth sciences. Thanks for your comment, JL. You are most certainly right that design is not nearly as popular a topic in the earth sciences as it is in the biological sciences. I honestly think that’s because there isn’t a lot of evidence for design in the details of geology. Some rocks look like they were laid down slowly over eons of time, and some rocks look like they were laid down catastrophically over short periods of time. However, I don’t know of many rocks that look like they were laid down according to some specific design. When you look at biology, however, there are a lot of things that look like they were designed. Thus, the question of design comes up a lot more frequently. I don’t agree, might not be the work of a God, could be any incomprehensibly intelligent being of your choosing…..How would anyone prove otherwise? There would be no way of proving otherwise, Pyrodin. However, as you admit, the Designer would have to be incomprehensibly intelligent, and that is one of God’s characteristics. I would think it difficult for computers to exceed people in terms of intelligence. They can process things more quickly and have more ready access to information, but in my mind, it would be hard for humankind’s creation to exceed humankind’s intellectual abilities. Well, machines exceed us in almost every other way. It will be a while, but someday humans will build a machine that can think better than we can. That is why we build machines, to do things better than we can, why stop at the brain, ehh? IBM even announced recently that it has created a “neurosynaptic computing chip” that mimics the brain, its part of DARPA’s SyNAPSE program. Whole other topic really, but the point I’m making is, if we can create a type of life other than our own, who or what else can too, and could they have created us? Pyrodin, I strongly disagree with the statement, “machines exceed us in almost every other way.” In fact, they fall short of us in most ways. They have no originality and cannot come up with anything that hasn’t already been programmed in them. They can’t heal themselves when they are “sick.” They don’t care for one another, etc., etc. Please note that programmers can’t even make a computer that passes the rather simple conditions of the Turing Test. IBM’s “neurosynaptic computing chip” doesn’t come close to acting like a human brain. All it can do so far is navigate, recognize patterns and classify objects. It cannot even learn yet, much less come up with something original. The abilities of computers are advancing at an alarmingly increasing rate, and into a number of directions unimaginable years ago. Difficulties in defining intelligence itself make real comparison even harder. The Turing test itself is a very weak indicator. To quote one scathing rebuke put it “Planes are tested by how well they fly, not by comparing them to birds. Aeronautical engineering texts do not define the goal of their field as ‘making machines that fly so exactly like pigeons that they can fool other pigeons.” Indeed in the early tests judges caught the computers because they typed too quickly and didn’t make spelling mistakes; the machines’ apparent “intelligence” had to be deliberately lessened to avoid giving away that clue! I read this BBC article a while back about how effectively smartphones can be automated to cheat in Pub quizzes for a hideously large number question types. On a more positive note, the human brain does still have a goodly head start. I enjoyed reading the following much more. Thanks for the links, Josiah. I agree that a computer shouldn’t be judged by how well it imitates a human. However, if you want to claim that computers will one day become smarter than humans, then at some point, they have to at least catch up to humans. That clearly hasn’t happened yet. No not yet, but when was the last time humans had an upgrade? Pyrodin, an evolutionist would probably say that humans are constantly being upgraded. If nothing else, an evolutionist would say they certainly experienced an upgrade from the time they went out of the Australopithecus genus (or whatever genus contains our nearest non-Homo ancestors) and jumped into the Homo genus. You could, indeed, say the same thing for a lot of humans. However, you can’t say the same for all humans. You can say that for all computers, however. I agreed with Josiah. However, I also pointed out that if you want to think computers can become better than humans, at first they have to at least become equivalent to them. So far, there isn’t a single one out there that has come even remotely close. Proof of god? Really? At one point the idea of a man doing a million calculations in a second or speaking to someone on the Moon would be something only the almighty could do yet we’re now easily able to do and surpass these feats. I simply don’t see god, just a highly efficient process that evolved over millions of years. We, on the other hand, have only been working on a 100% efficient engine for a few centuries and are already half way there-go us! Josh, you are quite right that we have only been working on a 100% efficient engine for a few centuries and are already halfway there. That’s what happens when intelligence and design are use. Intelligence and design allow us to do millions of calculations per second and talk to people on the moon. However, when you start postulating that random chance operated on by natural selection can produce millions of processes that surpass even the very best our intelligence and design have produced, you suddenly are way outside the realm of science. Observational evidence tells us that intelligence and design make efficient engines. There is no observational evidence to indicate that random chance and natural selection can do so. Because I tend to be guided by the evidence, when I see technology that far surpasses human technology, I deduce an intelligence and capability that far surpasses human intelligence and capability. Please note that I don’t use the term “proof” anywhere in this piece. Thus, I don’t think this is “proof of God.” In fact, as a scientist, I know that science cannot prove anything. However, science can build up lots of evidence, and this is just another piece of evidence in a mountain of data that indicate God’s existence. This evidence is so overwhelming that an honest and serious atheist like Antony Flew was forced to give up his atheism when he confronted it.